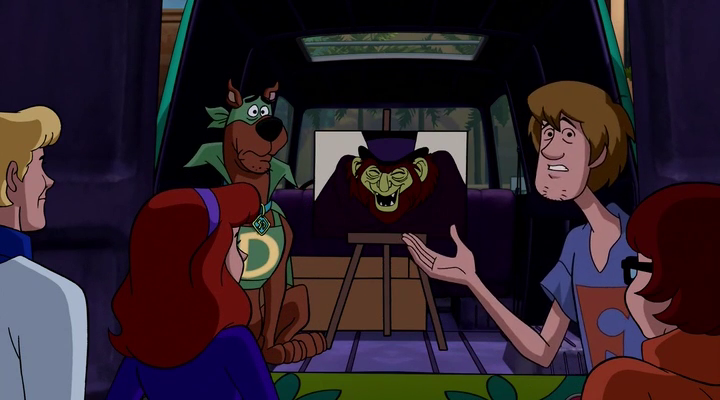 Animation, Blue Falcon, Dynomutt, Frank Welker, Grey DeLisle, Matthew Lillard, Mindy Cohn, Mr Hyde, Mystery Machine, Mystery Team, Review, Scooby-Doo, Shaggy, Warner Bros. Mask of the Blue Falcon opens with the Mystery Team investigating a haunting by the Manic Minotaur of Mainsley Manor. Once that mystery is solved, they head off to a fantasy convention in San de Pedro, California. Shaggy (Lillard) and Scooby (Welker) are excited to go as it will mean they get to meet their hero, Owen Garrison (Bennett). Garrison played the character of Blue Falcon years before on TV with his canine sidekick Dynomutt. 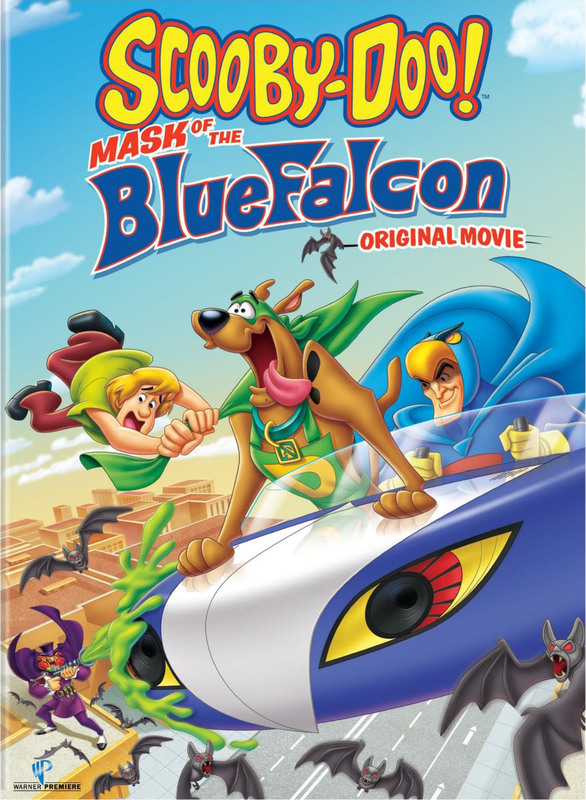 To Shaggy and Scooby the original Blue Falcon shows are much better than the new high-tech film version that’s being premiered at the convention. And it seems a character from the old series agrees with them: Mr Hyde, Blue Falcon’s arch-nemesis. He causes chaos using bats, a devil hound, and a toxic green goo. With the film premiere under threat, it’s up to the Mystery Team to get to the bottom of things and unmask Mr Hyde. Naturally this involves Shaggy and Scooby dressing up as their heroes. It’s fun to see the Mystery Team back in action in a movie that actually works. The last few movies, by general consensus, have been below par, but this outing is the best for some time, mixing the right amount of comedy, thrills and spectacle. The storyline holds the attention and although the identity of the villain is never in doubt to anyone who’s seen a Scooby-Doo movie or TV episode before, it doesn’t detract from the enjoyment the movie provides. The animation is crisp, the colours rich and realistic, and the voice work is exemplary; Jeff Bennett in particular merits a mention. His Owen Garrison sounds so much like Adam West that it makes the verisimilitude between Blue Falcon and Batman almost surreal. If it was the producers’ intention to sound like that then full marks to them, it was an inspired idea. The script, by Marly Halpern-Graser and Michael F. Ryan, is full of one-liners (Velma: We solve mysteries. Shaggy: And run away a lot. ), credible motivations for the chief suspects, exciting chases and villainous characters, and pulls the wool over everyone’s eyes by seeming to end the movie ten minutes before the end is actually due. If Warner Bros. have any sense they’ll keep these guys on the payroll for the next Scooby-Doo! movie. For those with a sharp eye there are cameos – walk-ons really – by Bram from Scooby-Doo! Music of the Vampire and Wulfric von Rydingsvard from Big Top Scooby-Doo!, and that’s beside the fun to be had from spotting other cartoon characters such as Space Ghost at the convention (I’ll let you search out the others). Rating: 8/10 – a welcome return to form for the series and a reminder that when he’s on top form there is only one Scooby-Doo – accept no substitutes! *This review was originally written in January 2013, and posted on thedullwoodexperiment website.